Action from Langtoft United's PFA Cup semi-final win over Stamford Lions. Langtoft are in red. Photo: David Lowndes. Langtoft United reached the PFA Senior Cup Final for the first time in dramatic fashion on Saturday (March 26). 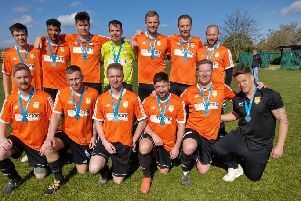 The villagers from the Peterborough Premier Division pipped Division One title favourites Stamford Lions at windswept Manor Way with a last-gasp goal from supersub Jamie Warner. Action from Langtoft United (red) against Stamford Lions in the PFA cup semi-final. Photo: David Lowndes. Warner netted following a 90th-minute long throw to book a date at Peterborough United’s ABAX Stadium against holders Whittlesey Athletic. It was heart-breaking for Lions who have also yet to appear in the prestigious final. Whittlesey’s semi-final against ICA Sports was also hampered by strong winds before the favourites emerged 2-0 winners with second-half strikes from Sam Donohoe and Liam Harrold. Donohoe opened the scoring on the hour mark with Harrold making the game safe 10 minutes from time. The final is scheduled for early in May. Whittlesey now have four teams through to end-of-season cup finals. “It’s a great achievement to be going back to the ABAX Stadium for the second year running,” Whittlesy manager Andy Lodge said. “Retaining the cup was one of our main goals of the season and we showed that on Saturday as we played with a great spirit and managed some decent football in difficult conditions. We definitely edged the game and deserved to go through. Langtoft United (red) during their PFA Cup semi-final win over Stamford Lions. Photo: Tim Wilson. Meanwhile Moulton Harrox carried on their merry way to the Premier Division title. They extended their lead at the top to 12 points after securing win number 22 of the season at the expense of Uppingham. Billy King (2), top scorer Ollie Maltby (2), Phil Groves, Ben Allen and Joe Townsend scored the goals for the unbeaten leaders. Peterborough Sports Reserves took advantage of Whittlesey’s cup commitments to move into second place with a 3-1 win at Holbeach United Reserves. Gary Gibbs, Dan Fountain and Jake Sansby scored the Sports’ goals. Tom Randall has found some sizzling form for Netherton United. He made it three top-flight hat-tricks in successive games in a 5-0 beating of Stilton United at the Grange. Fleet-footed Randall also bagged trebles against Holbeach and ICA Sports. Adam Scott and Ash Jackson also scored against Stilton. Pinchbeck United remain three points ahead of Netherton in fourth place following their 7-0 rout of Sawtry. Player-boss Ian Dunn (2), Tom Sargeant (2), Tony Edwards, Liam Ogden and Nick Bishop were their scorers. Biggest winners of the day were Stanground AFC who samshed bottom club Riverside 11-0 in a non-competitive city derby. Josh Staggs claimed a hat-trick with Shane Cooke (2), Josh Rosser (2), Martyn Fox, Jack Dean, Trey West and Sam Cross also on target. Veterans Teddy Paling and Graham Morris scored two apiece as Crowland won 4-1 at Leverington Sports, while Dan Ireland (2), Perry Rix and Jamie Sharpe scored the goals for Deeping Rangers Reserves in a 4-2 win at Thorney. Deeping Rangers Res 4 (Ireland 2, Sharpe, Rix).